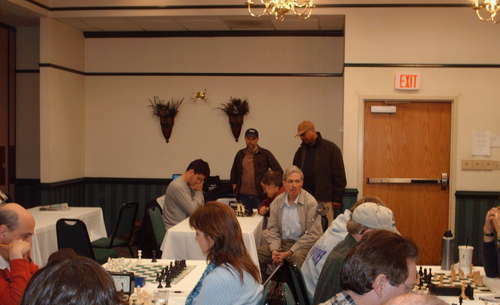 11.28.08 Twenty-six players turned out to compete in the MECA Augusta Series Fall Quads, played on November 22, 2008 at the Ground Round Restaurant in Augusta, Maine. Topping Quads 1-6 were Adam Schaff, Barry Magda, Jim DuBois, Akagi Kayashima, Kris Fecteau and Stephen Kaluzynski. 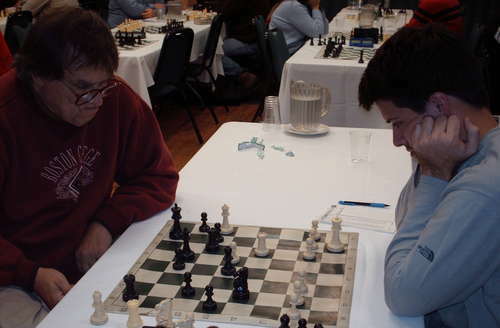 The Augusta Series is the brainchild of Portland Chess Club President, Lee Doucette. If you lost chess pieces at this tournament please contact the tournament director at lfdoucet@maine.rr.com. 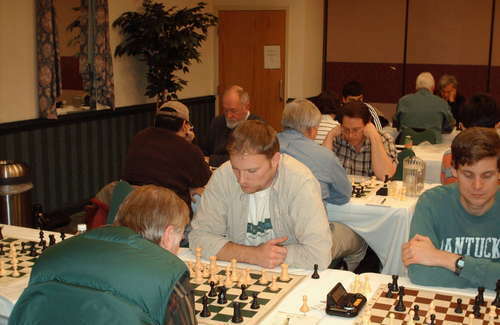 Curt Brock (center) plays the white pieces vs. Rob Shore in Round 2 of the MECA Augusta Series Fall Quads. Thanks to Lee Doucette and Barry Magda for contributing to this report. 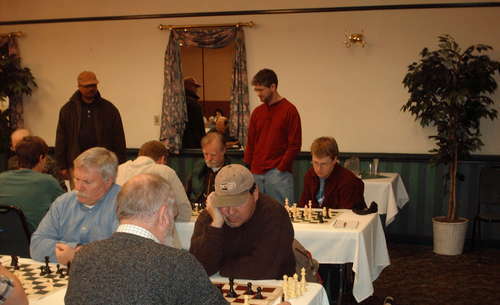 Adam Schaff (background right) studies his position during his Round 2 game vs. John Brady. Schaff went on to win this game and his third round game to place first in Quad 1. The tournament's only female player, Ann York of Turner, Maine, plays Dan Fishbein. In the background, Norm Dostie, Dave Lawrence and George Zimbis observe Steve Kaluzynski's game vs. Joseph Parker. Steve Kaluzynski (left) and Joseph Parker up close. 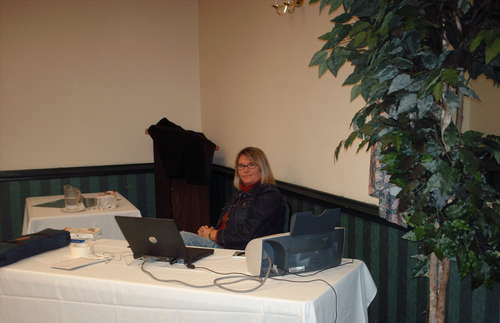 surveys the chess from behind the tournament director's table.